Eastern Customs: Enumerated Blessings - Attractive image from a Chikanobu series published from about 1887 to 1890. These charming scenes illustrate words that include the syllable fuku (or huku), which has many different meanings, but the primary meaning is blessing or good fortune. Women, children, and families are shown in daily life, playing games, enjoying different traditions, and celebrating festivals and events. 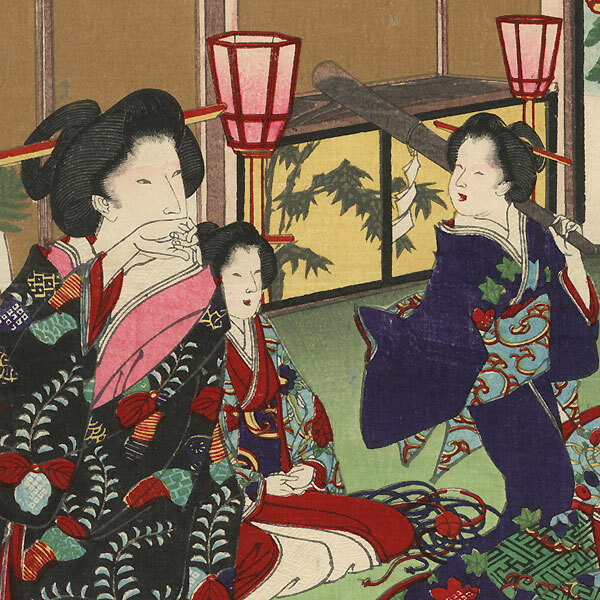 Beautifully drawn with fine detail and vibrant color, these lovely Chikanobu designs offer a wonderful look at life in Japan during the Meiji era. A rarely seen series and a nice choice for a collector. 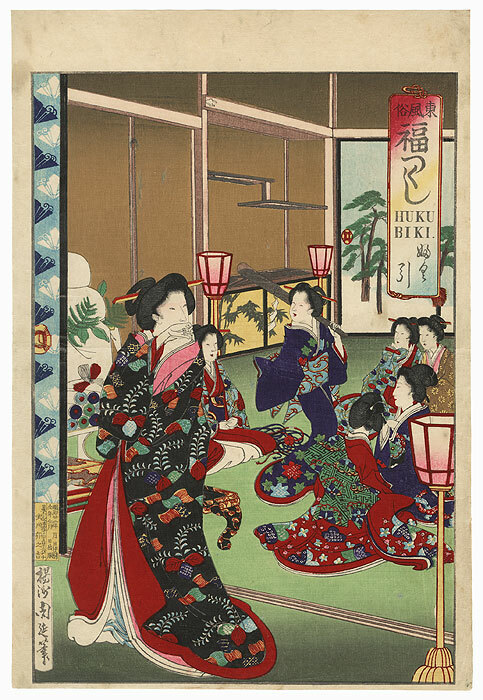 Fukubiki: Lottery - Charming scene of beauties in an elegant interior preparing to play a lottery game for the New Year holiday. 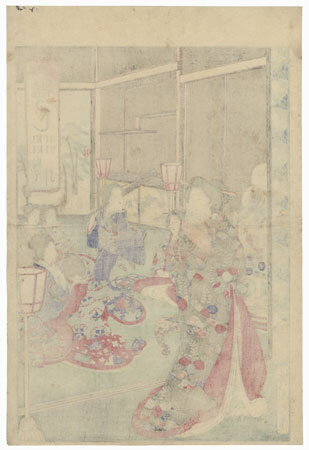 The beauty standing at left hides a smile with her hand as she watches the beauties gathered around the room. A woman in a purple kimono dances about in the center, carrying a wooden pole over her shoulder. A stack of giant mochi cakes, a traditional holiday decoration, can be seen at far left above shelves holds rolls of cloth. A nicely detailed setting, accented with embossing on the white kimono trim and burnishing on the black kimono. Condition - This print with excellent color and detail as shown. Horizontal centerfold. Slight toning and soiling, a few stains and creases. Please see photos for details. Good overall.